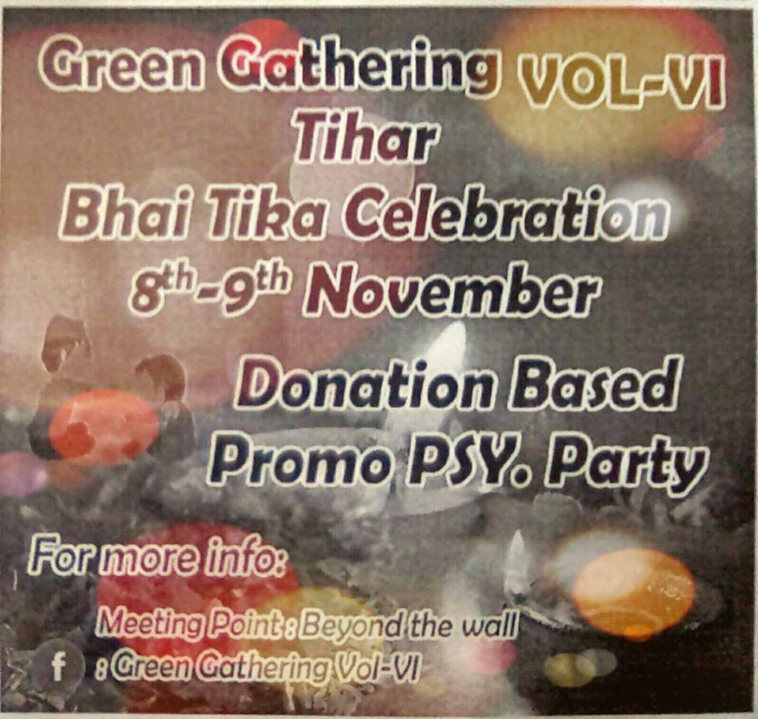 As festival of light Tihar is running Green Gathering Movements unity team Family would like to invite you for BHAI TIKA Celebration with Pre. gathering for Green Gathering Vol: VI. Bhai tika is the last, and the most important day of Tihar. In this day, the sisters apply Tika to their brothers’ forehead (and hence, given the name as ‘Bhai Tika’), thank them for the protection they give. The Tika is colorful, which consists of seven colors and called as ‘Saptarangi Tika’ in Nepali. Along with the Tika, the sisters offer garlands of Marigold and Chrysanthemum (nowadays the plastic ready made garlands are also used to some extent, in the case of scarcity of the flowers), sweets, and special dishes for them. The sisters pray for the brothers’ long lives, and have a talk with them, and enjoy the meal together. This is believed that Yamaraj, the God of death comes for the brothers, and the prayers of the sisters save their lives (as a gift to the sisters for their token of love). Brothers sit in a particular place, and the sisters do the puja, which consists of dropping oil from a copper pitcher on the floor and applying it to the brother’s hair. In return, the brothers also apply tika of five colours (pancharangi tika) to the sister’s forehead, and give them something as gift (it can be a sum of cash, clothes or anything materialistic). Those who don’t have sisters or brothers do it with cousins or close relatives. The temple inside Rani Pokhari of Kathmandu is open this day for those who don’t have brothers or sisters to gather here and apply tika considering themselves as soul siblings. The Bhai Tika is an important day for the Hindu, to strengthen the relationship between brothers and sisters. -You'll have to bring your own camping gears, if not than please inform us before. For anyone interested to volunteer, organize workshop or join in as artist for Green Gathering Vol: VI than please feel free to contact us at [facebook.com] .